We have said before that the Southern Italians can make what they have go a long way, and this dish is ideal for using up stale bread and slightly soft tomatoes. Dawn: Just as we have the kitchen back up and running, here we have a no cook recipe. Andrew: It is just ideal for the warmer weather, quite filling on its own, but excellent in a large bowl with a barbecue. Dawn: And the longer you leave it before serving, the more the flavour develops. Roughly tear the bread into bite size pieces. No need for ceremony here, as this is a rustic dish where presentation isn’t the key issue. Chop the tomatoes into different sized pieces. We have made this with a large beefsteak variety, some plum and vine tomatoes and a few cherry ones, for variety in colour and texture. 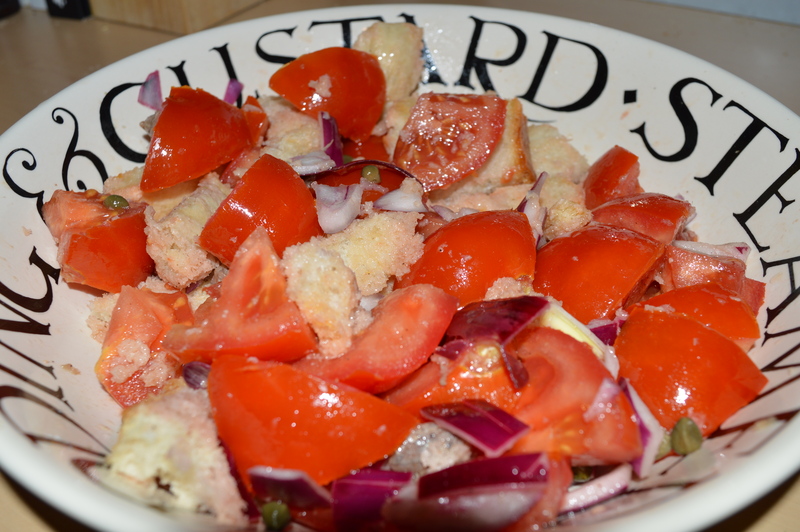 Place the bread and tomatoes in a salad bowl and mix well. Add the capers, olives and anchovies to the bowl, then sprinkle on the vinegar and drizzle over the olive oil. Mix well to allow the oil and vinegar to coat everything. They will moisten the bread, as will the juices from the tomatoes. Season well, and serve when ready. Andrew: There are no limits to this dish. A few cloves of roasted garlic, slices of roasted pepper and courgette can be added too. Dawn: A few basil leaves, and a crumbly white cheese like feta might add to the colour and flavour too. For more tips and recipes keep following our blog forfoodlovers.wordpress.com, Facebook and our Twitter feed @Love_Food_UK for ideas and ways to make your food go further. Posted on May 19, 2014 by Love Food UK	• This entry was posted in Home Cooking, Italian, Mediterranean, Super Salads and tagged Bread, easy to follow recipes, Easy to make meals, salads, Tomato. Bookmark the permalink.